For Home or Business use. Select the label Type and everything is automatically formatted for you so each address prints perfectly on the label you have selected. You can select the Row and Column to begin so that you never waste any labels on a Label Sheet. You can adjust the margin settings if you want to move where the address prints on the labels just in case your printer is out of alignment. Never forget another Birthday or Anniversary for any of your friends, family, co-workers or anyone in your contact database. Simply click on the Birthday Reminder option to see what's coming up in the next week, month or any Day range you select. Then quickly send them an email greeting, text message, phone call or print a label for them directly from Contact Wolf. The Custom Label Designer allows you to customize and design your own labels. You can select any of the data fields to print exactly where you want. Add a greeting to your labels, select a fun Font and personalize your labels! 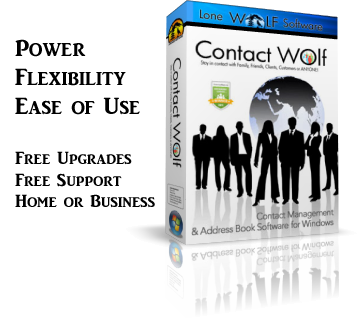 Contact Wolf allows you to send email using your current Email Client that you always use or you can use our "Built-in" Bulk Email Engine. So if you ever need to send a large amount of email messages you are ready to go! Simply Tag the records you want to send the messages to, enter and format your message and one click sends them on their way! You can configure the email engine to send the email through almost any email server like a GMail or Yahoo Email account. It's great for sending holiday Email greetings, sending product announcements to customers and clients or emailing Groups of contacts you have created in Contact Wolf. The Document Linker makes it EASY to link almost any type of document or file to a contact record. You can also link images, databases, PDF's or anything! When you click on a contact record you will see all of its linked documents, images, etc listed which makes it very convenient to find, edit and view the document. Simply double click on the Linked Document to automatically launch the appropriate client (program) on your computer to edit it. You can link the Documents to a special "Linked Document" folder that you specify so that whenever you select something to link its automatically copied to the "Linked Folder". This not only makes it easy to find all your Linked Documents but when you Edit it from Contact Wolf you are only changing information for it in the "Linked Folder" so the original document remains unchanged. The Reminder Window is where you view and edit Alarm Reminder notifications that you've set for your contacts. If you have Contact Wolf configured to display Reminders when you start it you will see this window immediately after launching Contact Wolf. You can edit, reset, cancel and manage your alarm reminders from this window. 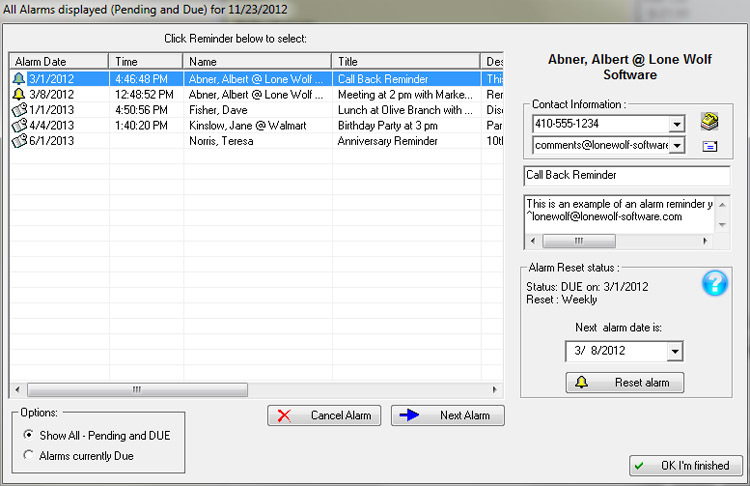 Contact Wolf allows you to set reminders to be displayed on a specific DATE or DATE/TIME. You can configure each reminder to automatically send you an email reminder when it triggers. We will also be adding an option to send a Text message to your cell phone soon! A Reminder can be set to automatically reschedule itself each time it displays. The Contact Log allows you to save a detailed contact history for every contact record in your database. Each entry is Dated and listed in chronological order. Its great for the average Home user that just wants to keep track of phone conversations and email correspondence between friends and family and extremely useful for business users that need to keep a record of all contact with clients and customers. 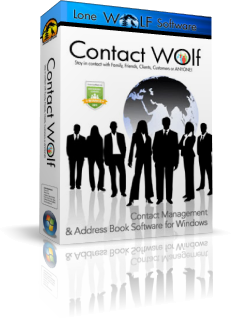 Contact Wolf includes a detailed Quick Access Help System that provides in depth instructions if you need assistance.. We have tried to design it so you never need to use the Help window but just in case you do its always available. We also provide free support for all our products. Contact Wolf prints out formatted reports for your personal and business contacts. Click on the links below to see actual screen shots of some reports. Copyright © 2016 Lone Wolf Software, All rights reserved.